In a gift box with absinthe spoon and serving instructions. 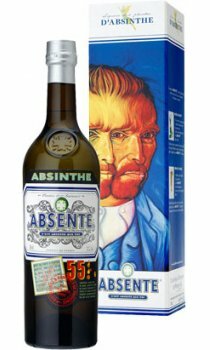 Absente '55', made with the same ingredients as the best Absinthes of 'La Belle Epoque', was the first of its kind to be legalised in France where it has been produced since 1915. This liquor is prepared from an infusion and essence of absinthe herbs (1,5 %), lemon balm and mint spirits, cane sugar and alcohol. In 1830, officers used to advise soldiers in Algeria who were not feeling well to add a few drops of Absinthe liqueur to the more-or-less pure water they were given to drink. But soldiers and officers alike preferred to increase the dose, and this beneficial liqueur also cured homesickness. And so abinthism was thus created under the African sun, and the medication became a source of inebriety. But anti-drinking campaigns sprouted up nearly everywhere in Europe, and their main target was Absinthe. Belgium banned it in 1906 and Switzerland followed suit in 1910. France simply levied a tax on it. But on January 7, 1915, Poincar confirmed these various measures; on March 4, he extended them to various limitations that applied to bars, and eventually there was a total ban on Absinthe.